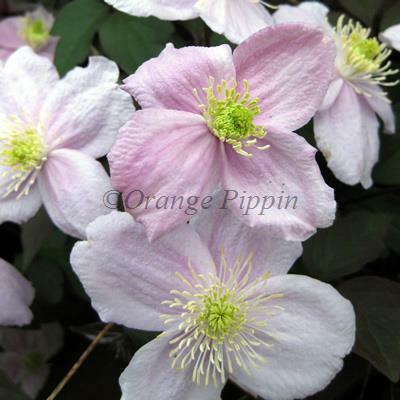 Clematis montana 'Mayleen' is a fast growing, vigorous, non-evergreen climber which produces masses of larger-than-average deep pink single flowers in late spring and early summer. The flowers have golden centres and an intense vanilla scent during the late spring and early summer, the fragrance of which can be enjoyed around the garden. The leaves are green, tinged with bronze adding extra appeal. 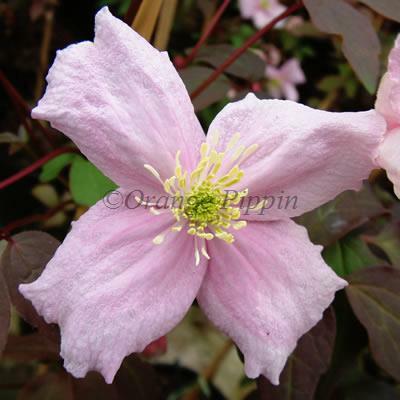 Clematis montana 'Mayleen' was raised in the 1970s by Jim Fisk of Fisk's Clematis Nursery, Suffolk, England, who received the original plant from a customer. It is usually placed in the 'rubens' sub-species of Clematis montana on account of the coppery-colour of the young leaves, although its flowers are somewhat larger than other varieties of this sub-species. 'Mayleen' is a vigorous fast-growing plant, capable of climbing up to 10m after about 10 years or so. No pruning is usually necessary, and it can be planted in any aspect. It is particularly important to keep 'Mayleen' well watered during the first few growing seasons, until its roots get fully established.